There are certain items every baby room needs but parents often miss them because they think a DIY alternative will suffice. Don’t make that mistake when it comes to dispose of your baby’s diapers. You probably think any old container will do. Are you sure you want to take that chance with the surprises your baby has in store for you? You’ll find the diaper pail market flooded with options because this is such a high priority item. Below we’ll help you find the best ones the world’s top brands have managed to design. They contend with all the challenges you’ll face when it comes to those interesting nappies you have to deal with. Which one will end up in your baby’s room? Do You Know How Many Diapers You’ll Change? How Often Do They Need Changing? Of course the market is filled with products that have nonsensical features too. We’re going to help you cut through the marketing noise and determine what you really need. 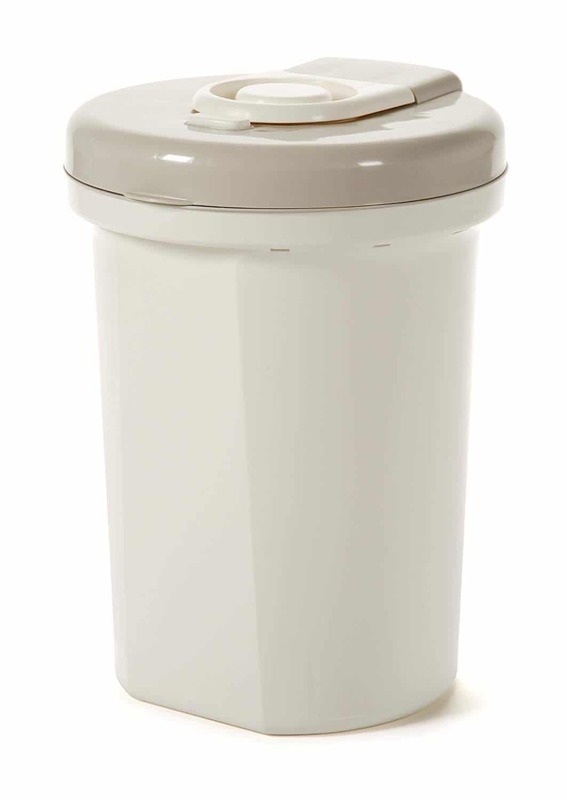 What Makes a Diaper Pail Different? This is not simply a container because manufacturers go to great lengths to ensure it deals with one main thing: Odor. It’s not only about sealing in smells but creating a mechanism that allows you to add more diapers to the pail without letting any bad smells escape. That’s magic! Perhaps you think you don’t really need one because the diapers you’ve changed aren’t that revolting. I have to warn you that it’s bound to change. The diapers of babies that only drink milk don’t always smell so bad. But remember your baby is going to start drinking more and you’re going to expand his or her diet. This will have a huge effect on what the diapers smell like. This is especially true during each transition period as the digestive system has to get used to new food products. You’ll find all shapes and sizes so you can really pick what you like. You don’t want your baby room cluttered so find one that will fit inside the room without you having to move all your furniture out of the way. Handy tip: Make sure you can place it where there’s enough clearance for the top to open. It’s ideal if it’s near the changing table and not underneath other furniture that makes it difficult to place a diaper inside. You don’t want the diapers falling on the floor in the process. These pails are valuable mostly for the fact that they can seal away odors. So that seal is essential. 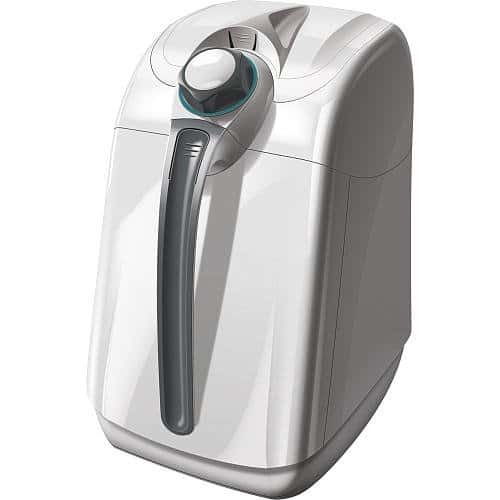 Research how the unit works so you’re sure it actually keeps the smells at bay if you open it and it contains diapers already. Why not make this something you actually like looking at? Your purchase should be more about functionality than aesthetics but you also don’t want one object to ruin the overall look you created in the baby room. It’s ideal if you can find a pail that takes just about any bag instead of customized refills. That means fewer expenses. Now let’s discuss a few options. Why we like it: This pail combines some of the most wanted features into one product so it’s a real all round winner. And that’s why it’s at the top of our list. You take care of yourself, your baby and the environment if this is in your home. It’s made of steel so there’s no chance of it becoming a hazard for the environment. It works well and effortlessly so diaper changing will be quick & easy for you and your baby. It looks stylish and is practical at the same time as it can hold up to 50 newborn sized diapers. The lids lock in smells thanks to rubber seals on the rims. The top cover has a sliding lid so you only have to open it enough to pop the dirty diaper in. The minimal movement doesn’t disrupt air so less odors will waft upwards when you open the lever. 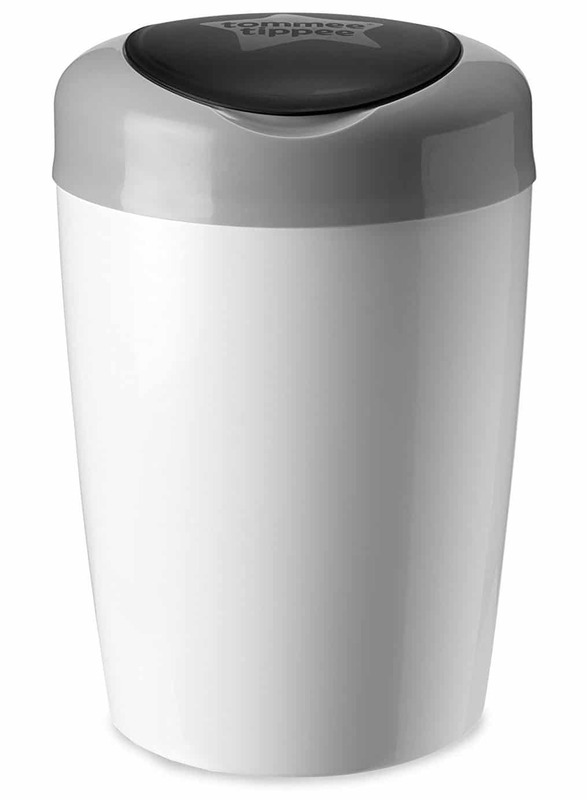 It’s a steel container which handles odors better for longer periods. This is thanks to steel being less porous than plastic. 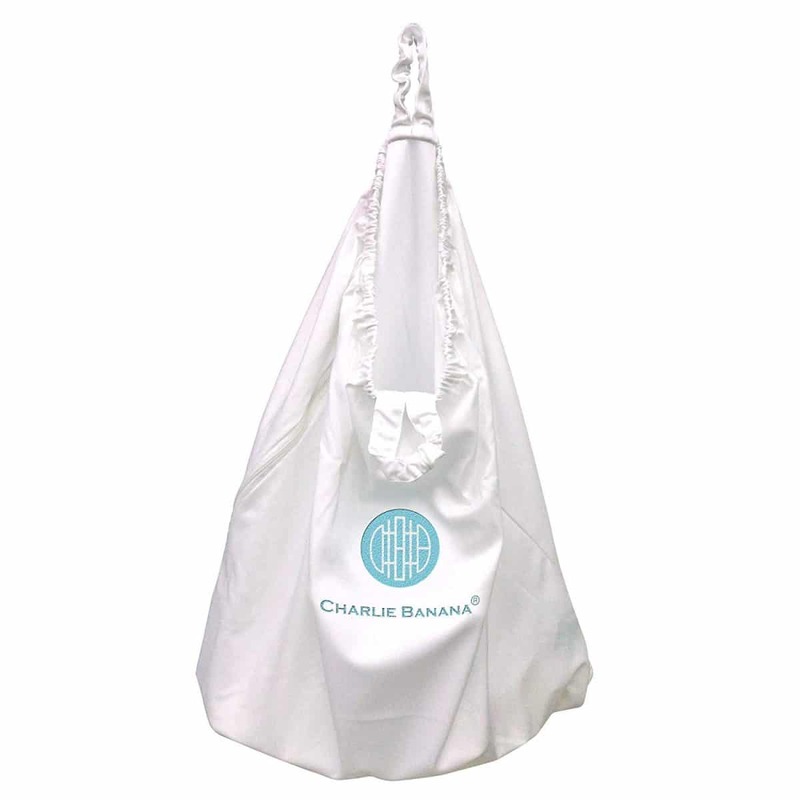 You can use any type of bags in this pail so no unnecessary expenses on custom designed bags. Best of all is you can get this unit in one of many designs and colors so you can purchase one that complements your décor. It’s oval shaped which makes it a large unit but slim enough to slide in between other furniture without taking up too much floor space. In the lid you’ll see a child proof lock so toddlers or curious pets can’t get to discarded nappies. You can pick one of many colors or three patterns. Note that the latter is only limited editions. Why we like it: It’s not only a looker! 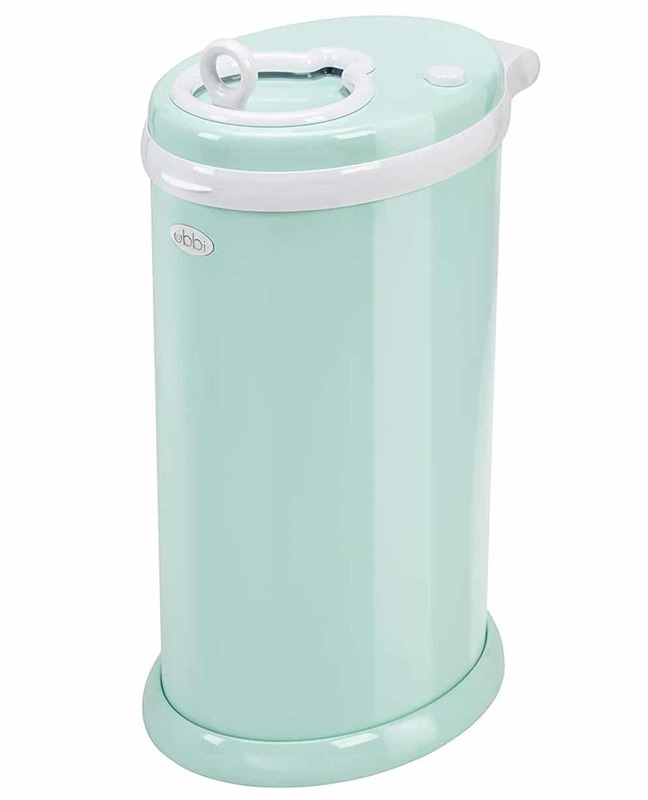 This stylish diaper pail has made many parents smile more than frown because it locks away the dirty diapers so those odors can’t waft into the room again. Another winner on this list. But this is still a favorite of many consumers because of the other great feature it’s famous for: How it keeps the discarded nappies locked away until you take out the large trash bag. When you open the top lid the odors can’t escape so you won’t have to fear each time you have to throw away another one. It’s also user friendly so getting this won’t rob you of precious time while getting to know its features. The Diaper Genie has a clamp mechanism which ensures the horrible odors can’t escape when you open the one area. This air tight clamp blocks off the discarded nappies at the bottom and you can place the next diaper in the top of the bag without smelling them. This movement is initiated every time you press down the foot pedal. When you take out the bag the bin can tilt forward which makes it easy to lift out the heavy bag. The bin’s cutter will slice the bag and you can tie it before throwing it away. It’s made of plastic. To combat the odors the bags are made of seven layers that lock in the smells. Only specially designed bags can be used in this pail. These refills are sold separately and as a whole can handle 270 dirty diapers. 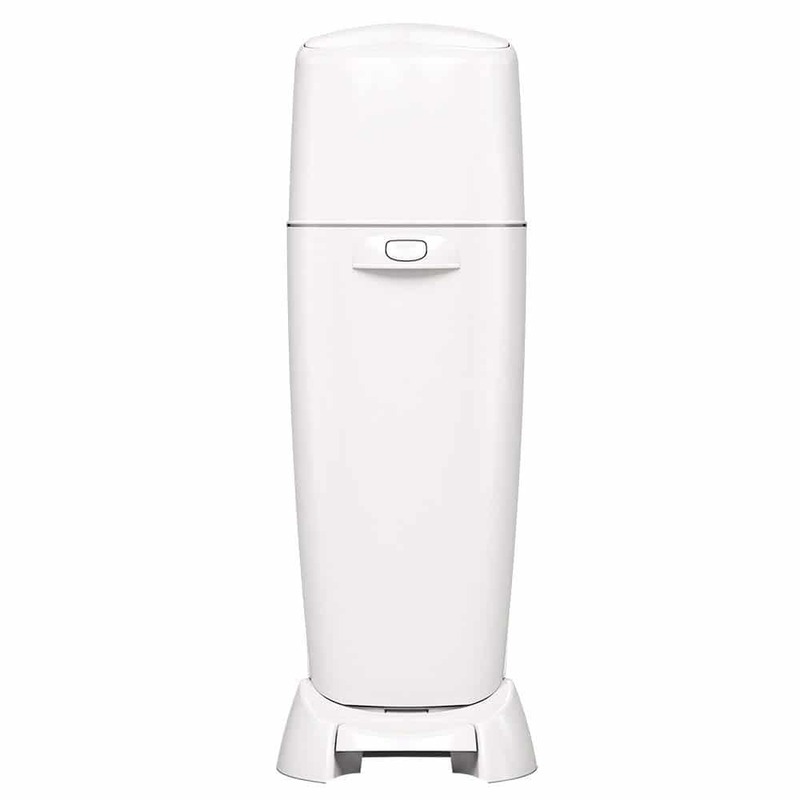 This unit is designed to be so tall so you don’t have to bend down much when discarding diapers or taking out the bag. Its dimensions are: 10.25” x 13.5” x 21.75”. Because the bin clamps shut the bag whenever you push the pedal there’s very little chance of your children getting into the mess. Just beware: Some consumers find the bag can get snagged on the components when you empty the pail. This could rip it and allow the contents to spill out. 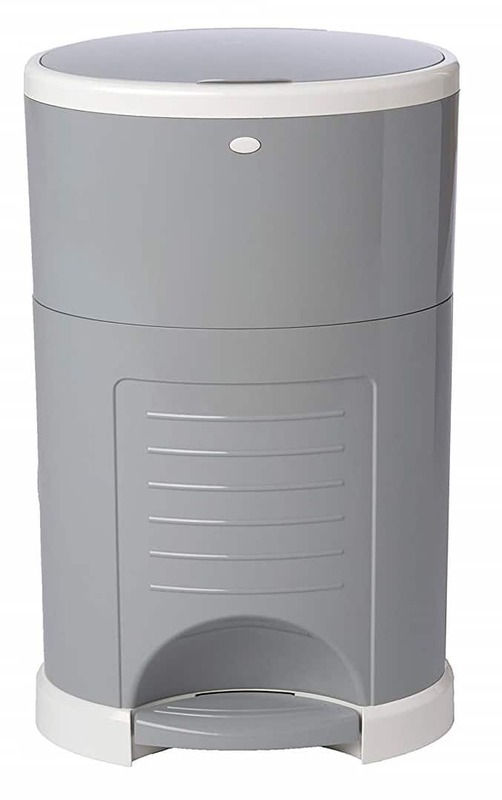 You can insert carbon filters in the lid which will further assist in managing unwanted odors. Why we like it: Yes this unit is made of plastic but it can actually help the environment since one tree gets planted for each pail that’s sold. We’re impressed when brands really care about the environment. This one looks good and performs well. The white exterior houses smart operations. At the bottom is a foot pedal which opens the lid so you don’t have to touch it at all. It works with customized bags combined with a patented technological device. This system seals away odors thanks to the way the bags are twisted closed above the diaper each time the lid closes. Just note: On occasion the bags’ twists require you to push down the diaper which isn’t ideal or hygienic. This is a plastic unit which won’t work as well as metal but it does have methods of locking away diapers and odors which prove to be greatly effective. On the upside this pail allows you to use either ring refills or snap, seal and toss bags. However you can’t place just any bag inside so you’ll have this monthly expense to put into your budget. It’s a super sleek design that will enhance your room’s aesthetics. Even though it’s made of plastic the silver finishes make it look very modern. It measures at 12.2” x 27.6” x 13”. The child lock button is out of reach of toddlers so there’s little chance of it being accessed by kids or pets. You can enjoy fewer odors when you use the baking soda cartridges. These pucks are lavender scented to counter bad smells. Why we like it: When you’re working with dirty diapers you want to touch as few things as possible and this design is all about helping you work hands free. It’s a basic design that works beautifully. This isn’t the most stylish unit on this list of reviews but it still serves many parents well. One of the reasons is the unique type of plastic that’s used so fewer odors stick to these surfaces. 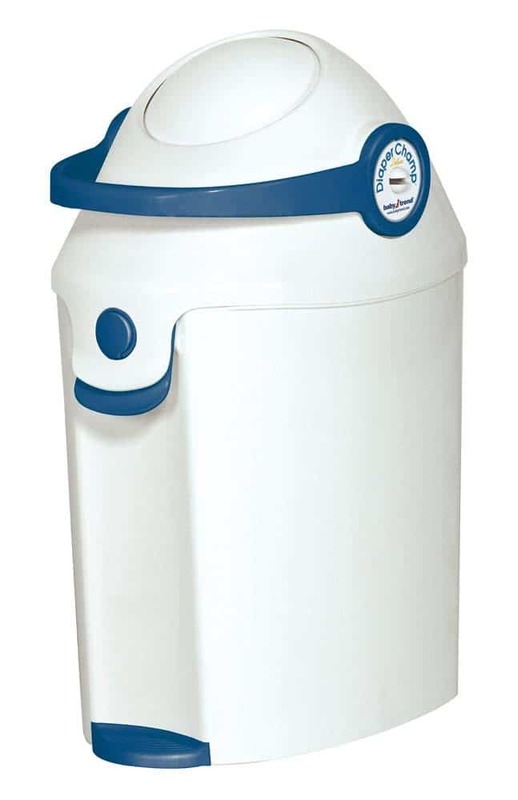 No matter how long you use this in your nursery it won’t be a waste of money as it can easily be converted into a normal dustbin. Step down on the lever at the bottom to open the lid so you can drop the bag inside. Releasing the lever closes the lid and the odor is locked inside. Because your baby may be startled at loud noises this lid actually closes very softly. It really is designed with babies in mind. Underneath the lid is an OdorKeeper trap door. This is spring activated so it will allow the diaper through and then close. This is what helps keep the odors trapped inside. It can keep up to 45 diapers inside at a time (newborn size). When you take out the trash you cut the continuous bag with the installed cutter and tie off the bag. It’s made of closed cell ABS plastic so it won’t absorb as many smells as some other plastic types. This pail works best with the customized bags you can purchase refills of. It’s not the most stylish but still a neat design that will fit in a bathroom or a nursery. The white or grey designs are compatible with most décor in babies’ rooms. The design includes a child proof lock so no toddlers will be able to open it and release those odors. The bags are baby powder scented. This helps to counter the smells you hate. You can also use this for cloth diapers by incorporating the Dekor Cloth Diaper Liner. 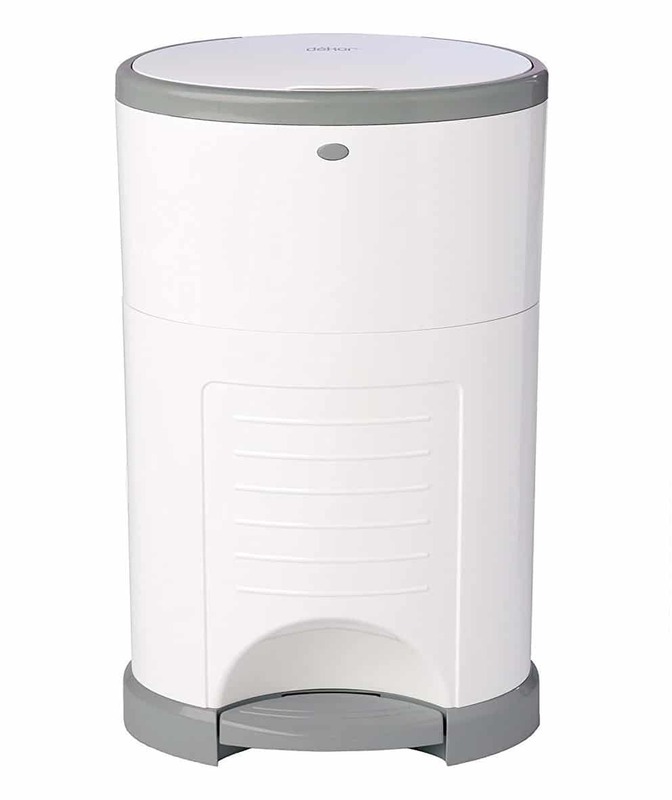 Why we like it: If a diaper pail is designed to make 20 second changes possible it will always rate high on our list. Parents want quick solutions and this could be one of them. This is similar to other Dekor products but this unit is for disposable diapers up to 60 in total. This makes it an ideal option for parents who have more than one child still in diapers or for twins. Even when your children’s diapers get bigger you’ll still fit a day’s discarded ones in here. You place a refill bag inside which you’ll cut and tie off below & above the cut. Now your old bag is ready to throw away and the new one is ready to start using. Each time you throw away a diaper you’ll step on the lever at the bottom, the lid will lift and you’ll throw it inside. No need to touch the pail so it stays highly hygienic. It’s made of quality plastic with fewer pores so there’s less chance of it absorbing odors or letting them through into the room. You need to use the Dekor bags but luckily the cartridges are reusable which will save you some money. This one is a bit big at 24” x 15” x 11” so make sure you have enough floor space and lid clearance. You can pick a grey one or get a white one which matches most décor styles. There is a child lock button so you can leave the room with peace of mind even if your toddlers are roaming around the house. Because of its size and the Dekor Cloth Diaper Liners this is a perfect solution if you prefer cloth to disposable diapers. Why we like it: Here’s a dynamic solution that will work for anyone because it doesn’t require customized bags. Even your regular trash bags will work well. It’s the budget solution! This is a user friendly design and even though it’s not the most stylish item you’ll find it has helped many parents. This is an upgrade from a previous similar model with a few enhanced features. At the top you’ll find a lever. This is used to bring up the compartment in which you deposit the used diaper. Switch the lever’s position to turn this compartment upside down and the diaper will fall into the bag. Most of the smells are kept inside the bag as the design seals off the bag from the air outside even when the plastic components move. The mechanism also means you never have to touch the parts where the diapers go so your room stays hygienic. To exchange the bags you take off the entire top part. This is a plastic model so you need to keep it perfectly clean to prevent odors from accumulating over time. Here’s the best feature of this pail because you can use any 13 gallon bags you have in the cupboard now. No need to spend more on customized items. If you want to you can use the Diaper Champ refill bags which will enhance odor control. This pail is large enough for a day’s diapers as it can hold up to 30 nappies. It measures at 11” x 14.5” x 21.6”. Different colors such as pink and blue are available. It’s low enough that toddlers can reach the lever. They may figure out how to move it and there’s no specific child proof feature. When you purchase this you’ll receive it already assembled. This prevents faulty setup that can lead to odors escaping. If it does start smelling you can take it completely apart—even the seals—and wash it thoroughly. Why we like it: Occasionally it’s necessary to let go of the usual way of doing things and try something new. This looks different and works different & if you get the hang of it it’s a winner. Many consumers who love this unit talks about the learning curve that’s necessary. Its unique mechanism may not seem to work at first but you just need to learn a few tricks and then it could be your new best friend. Of course not all parents have the time to learn how to use it so it would be great if this design can become more user friendly in future. It’s all done with the Super Seal technology. You place specially designed liners inside. The liner creates a sealed pocket by sticking to itself when you turn the rollers—found inside—which flip the bag. With the diaper sealed away there are fewer smells to contend with. The container itself is made of plastic. Unfortunately only specially designed liners can be used if you want the rollers to do their jobs. This looks ultra modern and may put that X-factor into your baby room’s décor. Thanks to its square design it should easily fit in between other furniture pieces. You can operate it with one hand and it’s a pleasure to empty because you don’t come in contact with the diapers. It’s more complicated than some other pails to open and thanks to the diapers being sealed inside there’s little chance of children getting access to the filthy nappies. The system uses antimicrobial protection. This limits odors and prevents them from getting worse during the day before you have time to take out the bag. Why we like it: As one of the smallest models on this list it’s the dynamic answer if you have limited space available. It’s remarkable how many features they placed in this compact design. 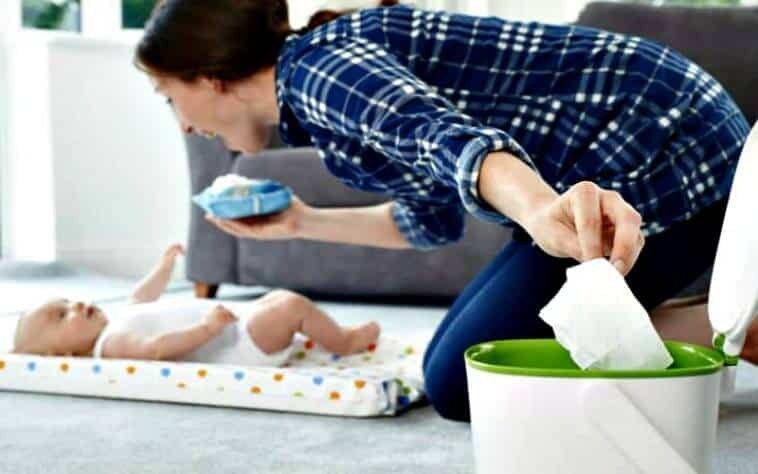 It doesn’t have high tech features to lock away diapers or odors but it does have deodorizer features that make a huge difference in small spaces. Both throwing away diapers and taking out the trash later on is easy because you simply gather up the bag; no complicated features. Of course this means it’s not as dynamic in dealing with odors but some consumers prefer a simple solution right? You lift the lid and drip the diaper inside. Then you can close the lid and walk away. It’s a one handed motion so it’s practical for parents who have to hold their babies while managing dirty diapers. It’s made of polypropylene—a high quality plastic—so you’ll have to keep it ultra clean to prevent odors from getting worse over time. Consumers love this pail because they can use almost any bag inside. Use trash bags or even kitchen bags. If you find scented bags that are cheaper than some other diaper pails’ custom made bags this is a dynamic alternative that still benefits your budget. It’s quite small at 15” x 10.9” x 18.4”. The exterior is smooth for easy cleaning but note it’s not the most stylish unit you’ll find. Remember to keep an eye or store it in a cupboard because it’s easily accessible to small children. You can fight some odors by regularly replacing the Dorizer discs in the lid. Why we like it: Not everyone has loads of floor space and this bin is compact enough to fit inside a cupboard or underneath other furniture. Luckily you find all shapes and sizes on the market and this unit can be ideal for smaller nurseries. It’s a simple design if you want a no fuss diaper solution but it still deals with odors. It even helps limit contamination by fighting germs. You lift the lid manually and then place the diaper inside by pushing through the smart lid. This locks in the odors. When the pail is full you cut the custom made film bag. This cutter is part of the unit. Then you can throw it away and the bin is ready to use again. 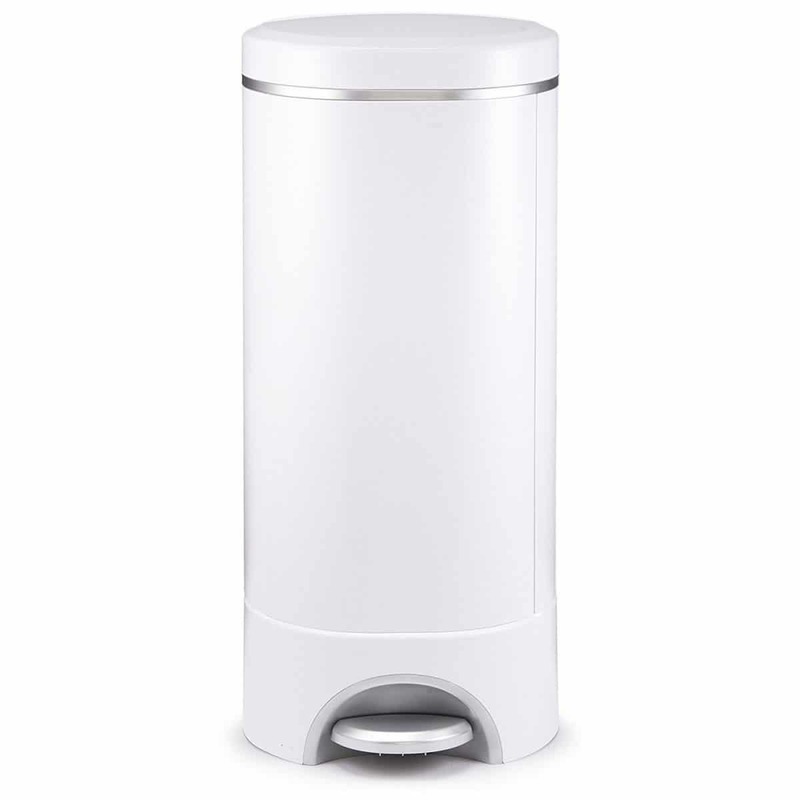 It’s a plastic bin so keep it clean to prevent it from absorbing smells quickly. You must use the specially designed films that you then cut and convert into bags each time you throw away a set of discarded diapers. This is quite a small design at only 16.4” x 11.6” x 10.1”. This won’t clutter the room but make sure it doesn’t invite curious dogs or toddlers. The benefit is that you can place this in a cupboard easily. It’s a simple design but not ultra stylish. Unless placed inside a cupboard this will be easy for pets or children to open. On the customized film that turns into your bags you’ll find antibacterial substances. This can kill up to 99% of germs which means your pail can help keep your nursery hygienic. Why we like it: This is the perfect space saver since you can hang it instead of using up precious floor areas. Don’t be perturbed by the unconventional. This is simply a bag but it makes total sense if you need to save floor space. And yes it can help you fight those odors. Firstly it’s easy to put this in any room no matter the size since it can hook onto anything such as a doorknob or a clothing hook on the door. When it’s full you can toss the diapers in the trash and this bag can be washed. This means smells won’t accumulate over time as they do in plastic containers. You’ll also find this works in some instances better than regular pails because the dirty diapers aren’t kept in air tight spaces. This matched with heat often lets the smells increase. Of course it all depends on the air flow in the room. You don’t have to place any bags inside this; simply toss in your diapers and empty when it’s full. Some parents use this reusable bag inside other diaper pails so try that to limit monthly expenses. This is a large hanging bag measuring 7.3” x 1.2” x 10.6”. It can take up to 20 diapers at a time. It doesn’t seal so make sure you hang it high enough that toddlers or pets can’t get to it. While this will suffice to hold soiled diapers it can double as a dirty clothing bag. Use this for whatever you need in the nursery. You can make life easy on yourself or do it the hard way. We suggest the first option and that’s why you need a diaper pail. And no this is not simply a glorified container. Don’t you want something to keep those nasty odors away from you when you throw away a diaper? High end designs enable you to exchange the refuse bags without getting a whiff of the dirty diapers. Some product help fight germs to keep nurseries hygienic. Are there any disadvantages? Of course. You’re going to pay a little more than for an ordinary dustbin. If you need to manage a budget it’s wise to look for a type that can take almost any bag. Your monthly costs will then be lower. Many baby products are designed to make parenting easier and more enjoyable. This should not be seen as luxuries. Remember: Every item that makes a task faster or easier allows you more time and energy to focus on other things. In the end this will make you a more patient and happy parent. So now you can decide: Run between the baby room and your outside dustbin every time there’s a diaper change or simply use the sealed unit in the corner. Here are some statistics to prove this is actually a huge part of parenting. To plan for this you can use a diaper calculator or simply be ready to change up to 6 000 diapers during your child’s baby and toddler years. This may vary according to your potty training timelines but even just during the baby years you should be ready for 3 000 diapers. Why not help yourself to 3 000 satisfied moments knowing that the intolerable smell is locked away. Please note that this is not a dustbin you can only clean out once a week. It will still need regular exchanges but it will be so much easier with one of these advanced models. Your pail should be cleaned daily. For the length of one day the products listed above are dynamic enough to keep smells at bay. Don’t leave it too long as the smells will get worse. Yes you can simply grab the first diaper pail you see but comparing them first will help you create the perfect baby room for practical and aesthetic reasons. Find out if the brand recycles plastic and whether the plastic can be recycled once you dispose of the pail. Does the brand use unnecessary packaging or the bare minimum? Are the resources they use sustainable? If this is very important to you you may prefer purchasing a metal unit since there’s less chance of it harming the environment. Some manufacturers offer you a variety of designs or make sure the pail blends in with popular décor trends. Take your time to find the right design so this purchase doesn’t ruin what you’ve created in your baby room so far. Look for types that don’t require expensive customized bags. What matters to you? Aesthetics? Technology? Spend money on the container that has the features you’ll appreciate instead of things you’ll never use or care about. Don’t accept the most expensive item is the most appropriate; find what works for you. Aim to make as few trips outside as possible. This is why you need a pail that seals well so you’re not forced to change the bag every few hours or after each diaper change. Make it easy at night as well by limiting the number of times you walk to the kitchen. Invest in bottle warmers with separate compartments to keep formula cool at night until it’s time to warm it. Invest in equipment that has night light features. This is wiser than running the risk of waking or startling your baby with regular lighting. These small details make a world of difference and can be how you help yourself cope better with the parenting adventure. It’s a simple thing but it takes care of a very important aspect of your day as a parent. The right pail will look good and ensure your room keeps on smelling like a baby’s room should. Did you find your favorite yet? Once you start using it you’ll wonder why you didn’t get this sooner.